Hi friend! I hope you’re having a beautiful week. 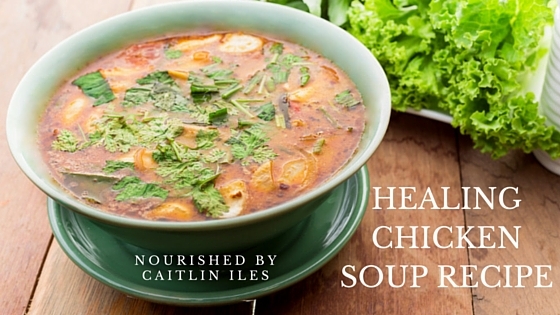 Today I want to share with you a recipe for a healing chicken soup. Last week I was rocked by a pretty vicious stomach bug and by drinking epic amounts of bone broth and taking the proper probiotics I’m back and feeling great. In order to safeguard against that happening again I’ve committed to drinking at least one cup of broth every day. However much I love broth and spices with seaweed, it can get a little dull after a time. Enter chicken soup! Everybody’s favourite comfort food. The key to today’s recipe is ensuring that you are using a homemade chicken bone broth as the base. Without this component, this soup recipe, while delicious, won’t be nearly as healing as it is the broth that contains the specific amino acids that support the immune system and help heal our digestive tracts. You can check out my recipe for a super easy broth here. All you need are some bones—I like to use chicken backs, but if you’re feeling adventurous chicken feet make a super tasty and nourishing base—, sea salt, vinegar, and water. Everything else is just fancy extras. You can also roast a chicken and use the bones from that to make your broth and cut up the meat to add to your soup. This soup really takes very little effort and the health benefits that it contains are worth every minute. Enjoy! Optional: 1 dried chipotle pepper. Heat olive oil in a large saucepan over low-med heat. Add onions, stir, and cover. While onions are cooking, finely chop garlic and celery. Add to pot with thyme, sage, star anise, cinnamon, and sea salt. Stir and cover. While veggies and spices are simmering, chop carrots into quarter rounds then add to pot. Chop chicken into small cubes and add to pot with chicken stock and bay leaves. Add chipotle here if using. Bring to a boil and then simmer until veggies are softened. Optional Upgrades: You may want to add wild, brown, or basmati rice for more body. Or you could use quinoa pasta. Well friend, that’s our healing and nourishing recipe for today. If you haven’t already, make sure you sign up for my mailing list to get the latest blog posts, specials, and info on upcoming events. If you sign up by clicking here you’ll get a free Fermentation E-book that is jam-packed with 40 pages of info on the health benefits of fermented foods plus 15 vegan and paleo recipes from coconut milk yogurt to Purple Power Sauerkraut. It’s my gift to you to say thank you for always supporting me. Have a beautiful day!